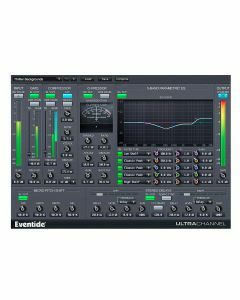 UltraChannel is a high-precision channel strip that includes several feature-packed versions of Eventide's legendary effects, all in one plugin. UltraChannel is a high-precision channel strip that includes several feature-packed versions of Eventide's legendary effects, all in one plugin. Whether mixing or mastering, regardless of genre, UltraChannel is the ultimate tool to make your tracks and mixes come to life. It not only has industry benchmark performance, but is also the most versatile channel strip available due to our exclusive FlexiPath routing, which allows processors to be ordered based on desired workflow. UltraChannel shines in carving out space for any instrument or vocal to sit just right in the mix. There are an infinite number of ways to generate the exact tone, dynamics and frequency characteristics you're seeking. Additionally, through its support for side-chaining, you can use an alternative audio source to colour the characteristics of your main signal. It wouldn't be an Eventide if it didn't also feature micro pitch functionality (from our flagship H8000 hardware) to thicken or increase the stereo spread of any instrument or vocal. O-Pressor - Comes with two built-in compressors, one with de-essing and side-chaining, the other is the unique O-Pressor. Derived from of our legendary Omnipressor, the O-Pressor adds character and extreme compression to your signal-processing arsenal. Over 200 Presets - Includes wide range of Factory Presets, many created by Eventide artists, tailored to signal sources such as guitar, bass, kick drum, snare, piano, strings, synths and vocals. They make exploiting UltraChannel's enormous processing power easy to deploy. Micro Pitch Shift & Stereo Delays - Apply Eventide's patented pitch shifting to any source and control the panning and delay spread. Runs in parallel with a pair of delays that allow you to feed its signal back into any of the other modules.